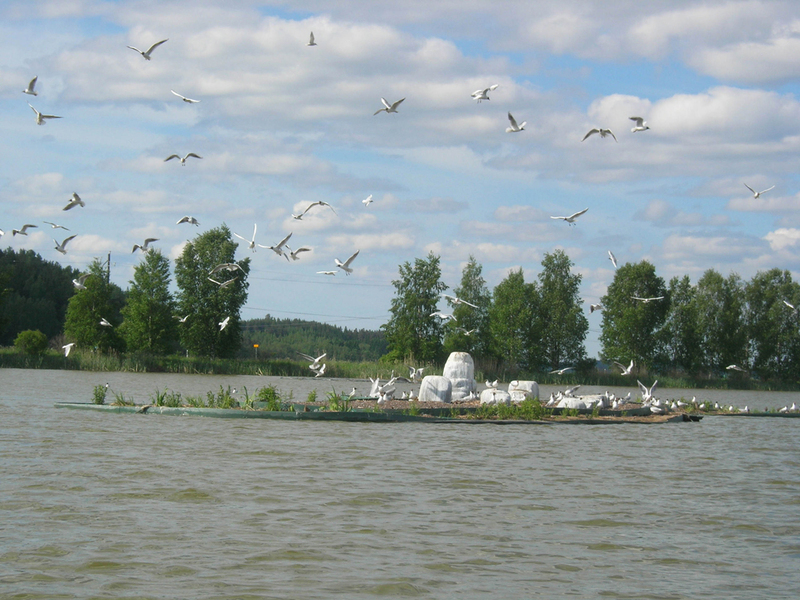 Veden Taika (The Magic of Water) consists of three floating islands in Salo, Finland. The islands provide nesting habitat for birds and plant based filtration for improving water quality in the Salo Bird Pools, lagoons that were formerly used in the sewage treatment processes of the Salo Municipal Sewage Treatment Facility. Because an abundance of migrating and nesting birds now use the lagoons, the pools have been established as an EU-directive conservation site. The birds need nesting areas separated from surrounding land to protect the eggs and young birds from predators. Analyses of the sediment at the bottom of the Bird Pools revealed residues of oils and fatty organic pollutants, as well as some heavy metals, the legacy of the former uses of the pools. The largest island (7.45m x 28m) provides nesting habitat while the two smaller islands (11.45m x 6m) contain plants for phytoremediation. These islands are vegetated with plants specially chosen to remove pollutants from the water and sediments, completing the cycle of transformation that began years ago with the sewage treatment process. During the warm months a cloud of mist rises up over the islands several times a day. An aerator beneath the islands oxygenates the water and stimulates microbial processes on the plant roots to encourage microbial diversity. Veden Taika is a collaboration with local volunteers, regional science experts, the students and faculty of the Salo Polytechnic Institute, the Salo Parks Department and Office of Environmental Protection. Biomatrix Water and the superb coordination of artist Tuula Nikulainen.